Aspiring artists, understandably, want to make lots of noise, although some realize that ambition more literally than others. But explosions are fleeting. What’s left for viewers who weren’t present for the big bang? In the case of Marley Dawson, the forensic evidence is a series of smudgy black circles or arcs burned into the white walls of Hemphill. Before “Statics and Dynamics” opened, a few observers were invited to watch the D.C.-based Australian artist ignite the charges that completed his “Circle Works” series. Dawson is drawn to streamlined machinery. His current work includes stylized models of soap-box racers and wood-and-metal “Tunnel Objects,” probably a reference to the wind tunnels that test aerodynamic qualities. Three polished-steel discs, mounted on the wall, lack the pyromaniacal appeal of the burned-circle pieces yet are more permanently dynamic. They can be spun by hand and are expertly balanced so that a simple push keeps them turning for minutes. These days, there’s a different sort of near-perpetual-motion device: video. 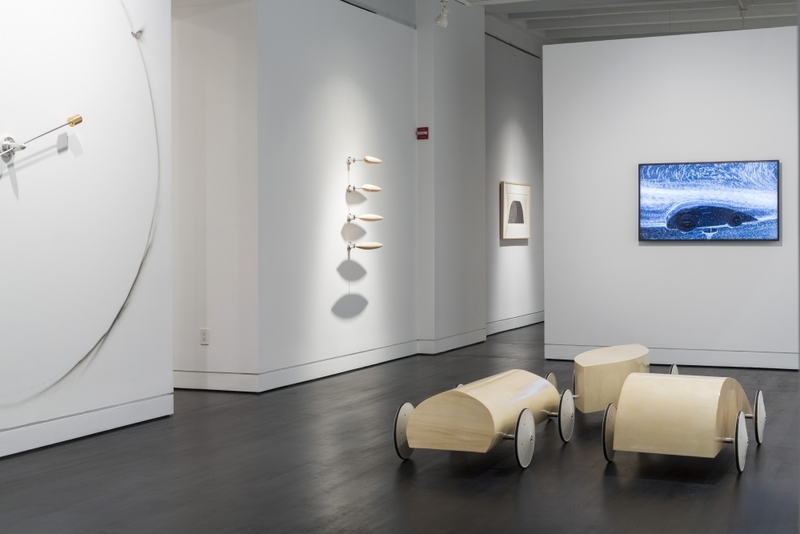 The show includes an untitled black-and-white video in which fluid deflects around a miniature soapbox-racer shape. The image appears digitally animated, with bubbles that look as solid as the blocklike pieces of water in “The Lego Movie.” But Dawson favors the real over the simulated, and it turns out that the video is a live feed of a small model submerged in air-rippled oil. Like the artist’s other works, the video is elegantly stylized yet stubbornly mechanical.